Marketing Hub Enterprise customers now can track their competitors in social using a new integration with Rival IQ. This integration gives marketers insight into what top competitors are up-to on social, and the engagement within their social presence. As marketers we are always benchmarking against our competition. This new integration enables marketers to understand what type of content competitors are producing, what pieces of content they might be boosting, and what content is generating engagement -- all right from HubSpot. Within social monitoring, you’ll now see the option to view competitor streams at the bottom of the left-hand sidebar. 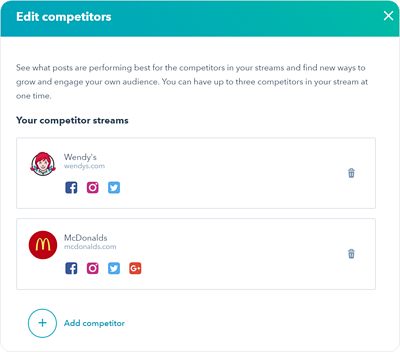 Clicking into this tool, you’ll be able to add up to three competitors at a time that you want to monitor. 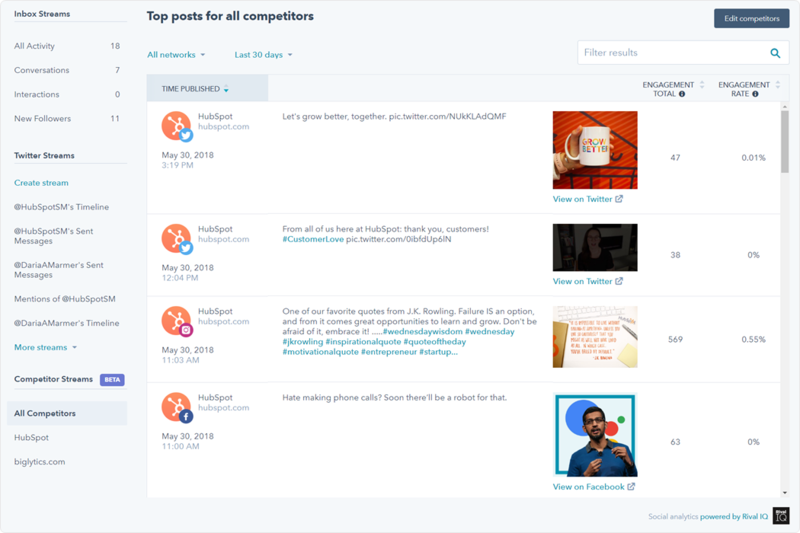 Once added, you’ll be able to compare and contrast the top posts of your competitors. See how many engagements each post received, and the engagement rate for each post --- a comparison of post engagements vs the number of followers the account has. This is now live to all Marketing Hub Enterprise users of the social tool.